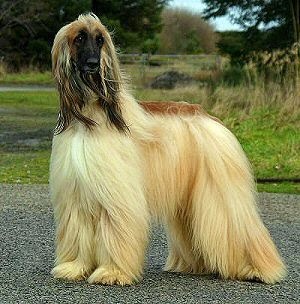 Afghan Hounds are sensitive and high-spirited and do not respond well to rough handling-so be gentle. The Afghan’s coat can be any color or combination of colors, including black and tan. The comedic actor Zeppo Marx was an early fan of the Afghan, importing two from Britain in 1931. The Afghan Hound stands out for his distant gaze; long, silky topknot; beautiful coat; prominent hipbones; large feet; and ring tail. Afghan Hounds won Best in Show at Westminster in 1957 and 1983. 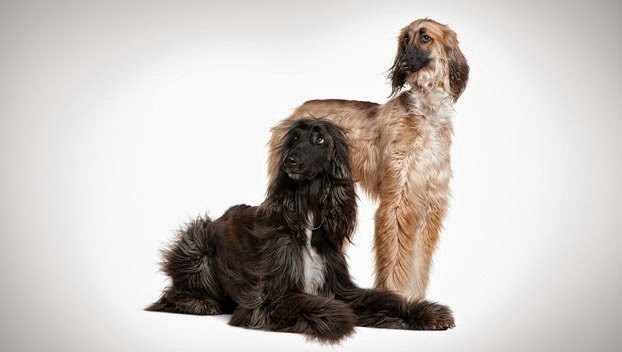 The Afghan Hound is from Afghanistan, but little is known of his early history or how long he has existed. A drawing of one of the dogs, sent home by Thomas Duer Broughton while he was in India in 1809, was published in a book of letters in 1813, so the breed has certainly been around for more than 200 years and likely very much longer. Studies of the canine genome indicate that the Afghan descends from one of the oldest types of dogs. The dogs in Afghanistan were found in several different types, depending on the region they were from. Dogs from mountainous areas were more compact with darker, heavier coats, while desert-dwelling dogs were more rangy, with coats that were lighter in both color and volume. They were used to course fast-running game such as deer and antelope, as well as hares, wolves and jackals. Hunting in partnership with falcons, they flushed quail and partridges for the falcon to bring down or the hunter to shoot. British military officers brought the dogs to the West after being posted to the India-Afghanistan border. The dogs died out in Europe during World War I because food shortages limited the breeding and keeping of dogs, but breeding began again in 1920 when some desert-type Afghans were imported to Scotland by people who had been stationed in Baluchistan. Some of the mountain-type dogs were sent from Kabul to England in 1925. During the same decade, Americans imported some of the Afghans from Britain. 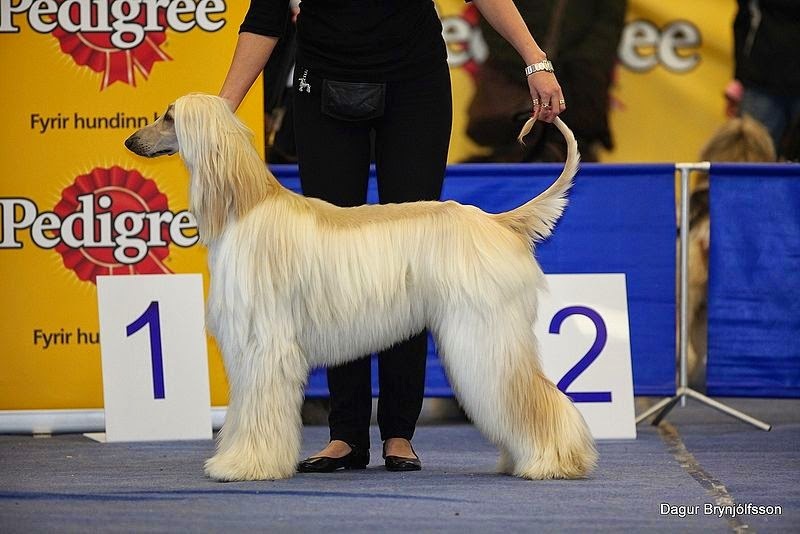 The American Kennel Club recognized the breed in 1926, but the Afghan Hound Club of America wasn’t formed until 1937. Today the Afghan ranks 86th among the breeds registered by the AKC. The independent thinking of the Afghan makes it a challenge to train. This hound is generally not motivated by food and does not possess as strong a desire to please as many other breeds . Though the Afghan makes a stunning presentation in the show ring, for example, more than one professional handler has been embarrassed in the ring by a refusal to cooperative. Even so, this breed is known for outperforming other breeds when the decision to do so is his own. The Afghan Hound, which has an average lifespan of 12 to 14 years, is not susceptible to any major health concerns. It should be noted that the breed can suffer from tail injuries and reacts to barbiturate anesthesia. Health ailments like canine hip dysplasia (CHD), cataract and necrotic myelopathy are also occasionally seen in the breed. To identify some of these issues, a veterinarian may run hip and eye exams on the dog. This perfect house dog requires careful brushing and combing of its coat. Special care should be given at the time when the dog sheds its puppy coat. 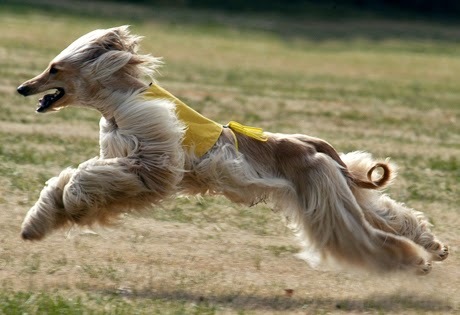 The Afghan Hound also requires daily exercise such as a long walk or a short sprint. In fact, this hound loves to run at a fast pace in small areas. Afghan Hound lovers should make it a point to provide the dog outdoor access and a nice, soft bed. 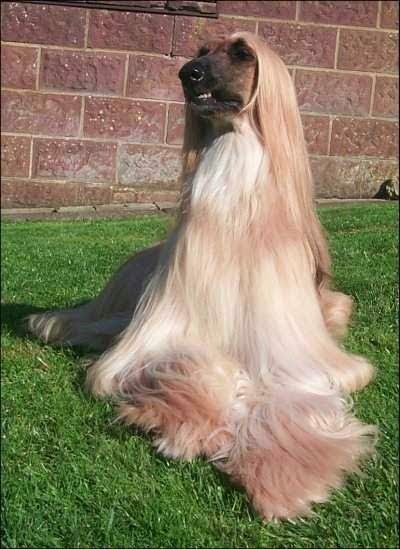 The Afghan Hound needs to be taken on a long daily walk or jog. While out on the walk the dog must be made to heel beside or behind the person holding the lead, as in a dog's mind the leader leads the way, and that leader needs to be the human. Dogs that do not get to go on daily walks are more likely to display behavior problems. Teach them to enter and exit door and gateways after the humans. They will also enjoy running free in an open, fenced, safe area. 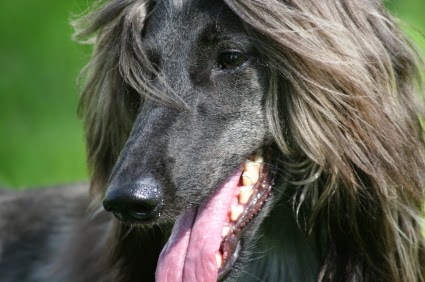 The Afghan Hound has long, thick, silky hair with a fine texture. The coat does not need to be clipped or trimmed; the dog wears it in all its glory. The finishing touch is a topknot of long, silky hair. Grooming is an essential part of living with an Afghan. 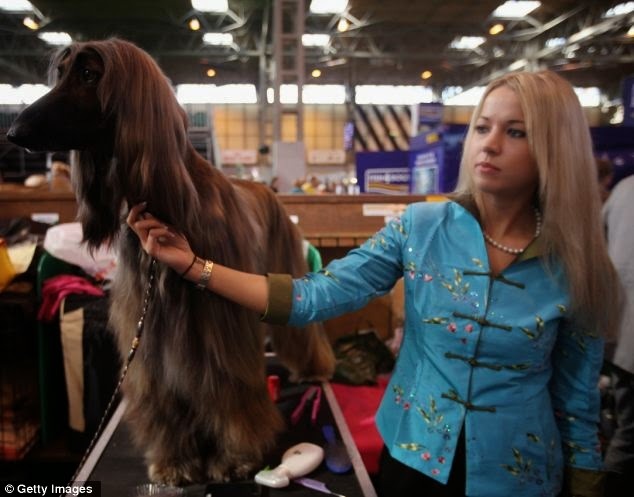 Plan to brush and comb the Afghan Hound’s thick, silky hair three times a week to prevent or remove mats and tangles, and bathe him as needed. You may want to invest in a professional dog blow dryer if you bathe him frequently. The Afghan sheds moderately. The more often you brush him, the less hair you will have falling off the dog and onto your floors, furniture and clothing. The rest is basic care. Trim the nails at least monthly, and keep the long, hanging ears clean and dry to prevent infections. At mealtime, you’ll probably want to put the ears up in a snood to keep them from dragging in the food dish. Good dental hygiene is also important. Brush the teeth frequently for good overall health and fresh breath. The Afghan Hound is a playful pup who needs and loves a lot of exercise. Great companions with a love of the outdoors, Afghan Hounds need a home that will give them plenty of space to stretch their legs. Best as one person's pet or as the only pet of the family with older children, Afghan Hounds will need an owner that can devote plenty of time to grooming their long, beautiful, thick coat. The Afghan tends to most enjoy the company of his own kind-other Afghan Hounds. The Afghan will tolerate, even be indifferent, to other pets in a household. Not surprisingly, the Afghan's hunter's instinct leads him to chase small animals, especially if they run away. Because of its distinctive appearance, the Afghan hound has been represented in animated feature films and TV shows, including Universal Pictures' Balto (Sylvie), Disney's Lady and the Tramp II (Ruby), and Brainy Barker from Krypto the Superdog, an Afghan hound also appeared on 101 Dalmatians as well as in 102 Dalmatians as one of the dogs in Cruella De Vil's party and the television series What-a-Mess (Prince Amir of Kinjan; based on children's books by Frank Muir) and, as Prissy in the 1961 Disney animated film One Hundred and One Dalmatians and 101 Dalmatians II: Patch's London Adventure. Afghan hounds have also been featured in television advertisements and in fashion magazines. 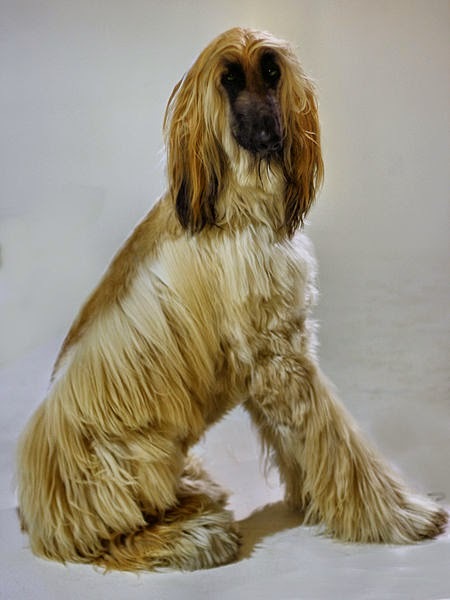 The Afghan hound is represented in books as well, including being featured in a series of mystery novels by Nina Wright (Abra), and a talking Afghan Hound in David Rothman's The Solomon Scandals (2008, Twilight Times Books). 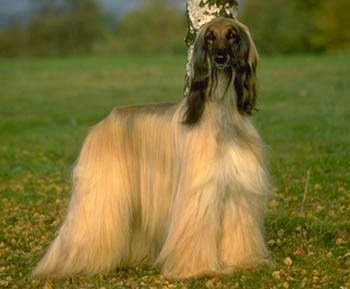 In the novel Between the Acts, Virginia Woolf uses an Afghan hound (named Sohrab) to represent aspects of one of the book's human characters. 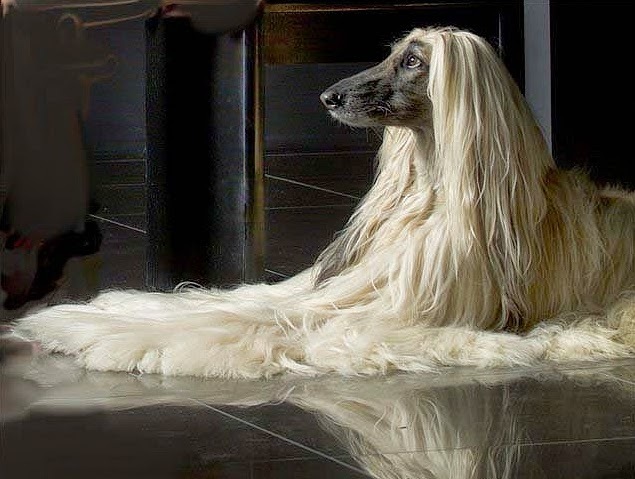 The Afghan Hound features prominently in the avant-garde music video of popular French band M83's, "Set in Stone ." British military officers brought this breed to the West after being posted to the India-Afghanistan border. Waking up early in the morning with a bowl of chow, the Afghan Hound is ready and waiting for his morning grooming session. After a good brushing, he's yearning to get out and explore the outside world. He'll chase squirrels right off the property while his owner applauds, and after a few laps around the backyard, he'll engage in a wonderful game of play with his master. Going inside for a nice nap, he'll sleep at his owner's feet as he's lovingly brushed down for the second time that day. Another few runs in the yard and the Afghan Hound will happily snuggle down in his dog bed.